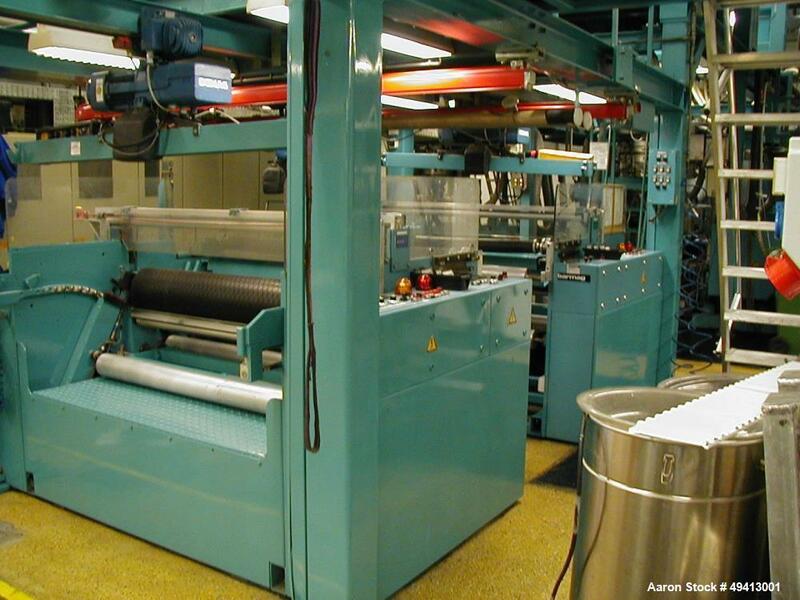 Used- Barmag 5 Layer Co-Extrusion Blown Film Line, type BF12-5/5-1400 AK. Capacity of 495 lbs. (220 kgs) per hour consisting of: (2) Barmag 45 mm (1.75") single screw extruders, type 4E8/27D-G. 27:1 L/D ratio. 3 Zone non-vented barrel electrically heated, air cooled. Driven via a gearbox by a 28.5 Kw/42.75 hp motor. 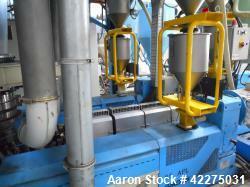 Includes blending/feeding system. (1) Barmag 60 mm (2.34") single screw extruder, type 6E8/27D-G. 27:1 L/D ratio. 3 Zone non-vented barrel electrically heated, air cooled. Driven via a gearbox by a 49.5 Kw/74.25 hp motor. 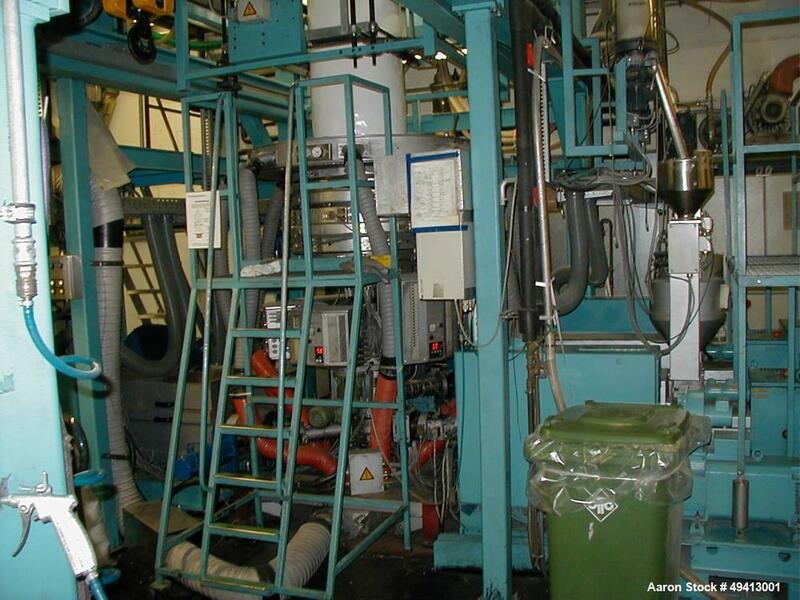 Includes blending/feeding system. 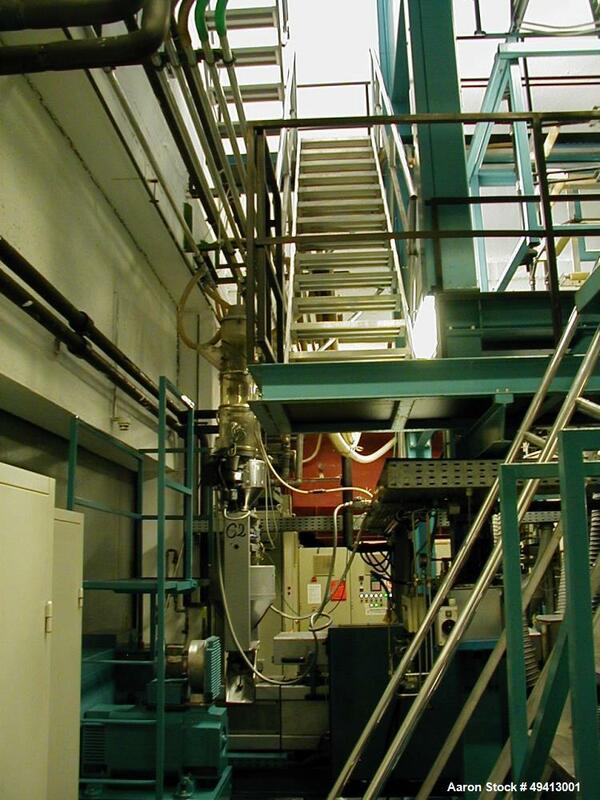 (2) Bargmag 75 mm (2.93") single screw extruders, type 7E8/27D-G. 27:1 L/D ratio. 3 Zone non-vented barrel electrically heated, air cooled. Driven via a gearbox by a 70.5 Kw/105.75 hp motor. 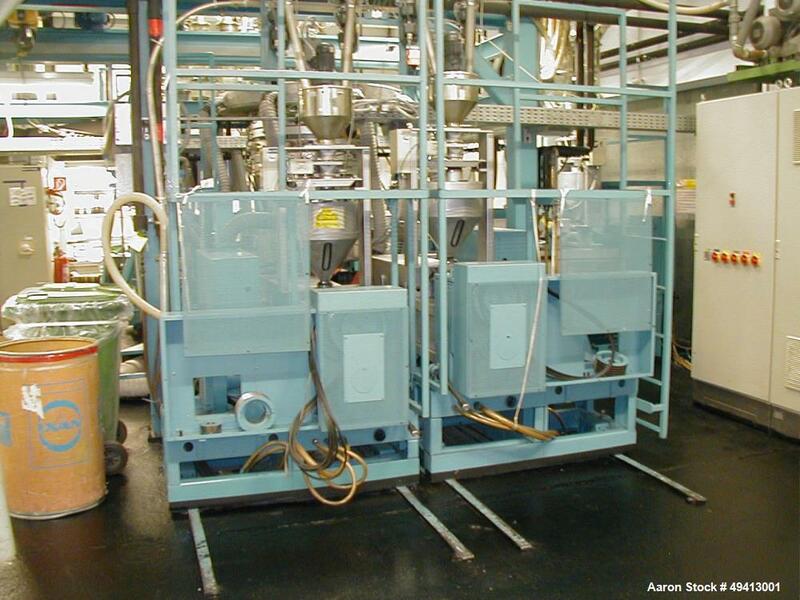 Includes blending/feeding system. 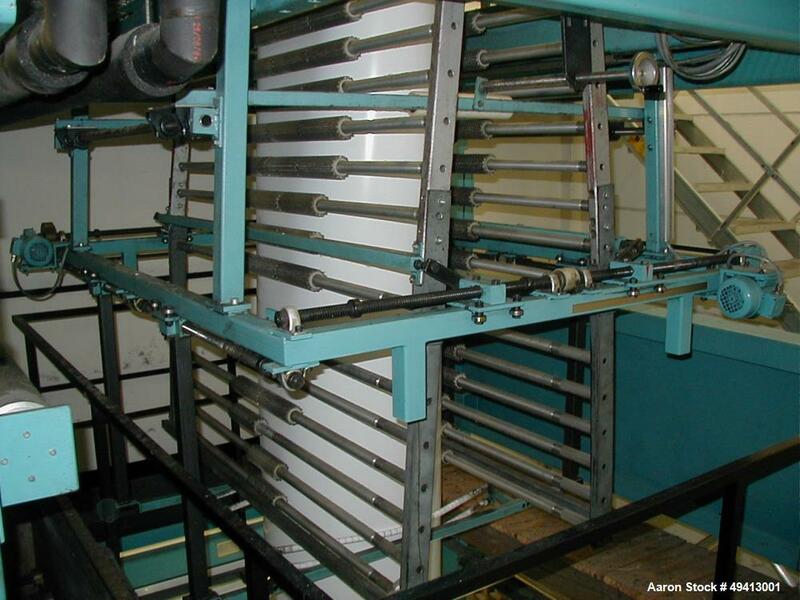 (1) Barmag rotating blown film die, type RTV4/4E8-W 12.48"/23.4" (320 mm/600 mm) diameter, internal double cooling. Includes interchangeable inserts. On wheels, (1) Barmag cooling air ring, type UF1/320-600 with blower, (1) Barmag height adjustable collapsible frame, type with nip roll station. (1) Barmag after cooler, type NKW 1400, (1) Barmag stainless steel water bath, type WB-1400 incl. temp. control. 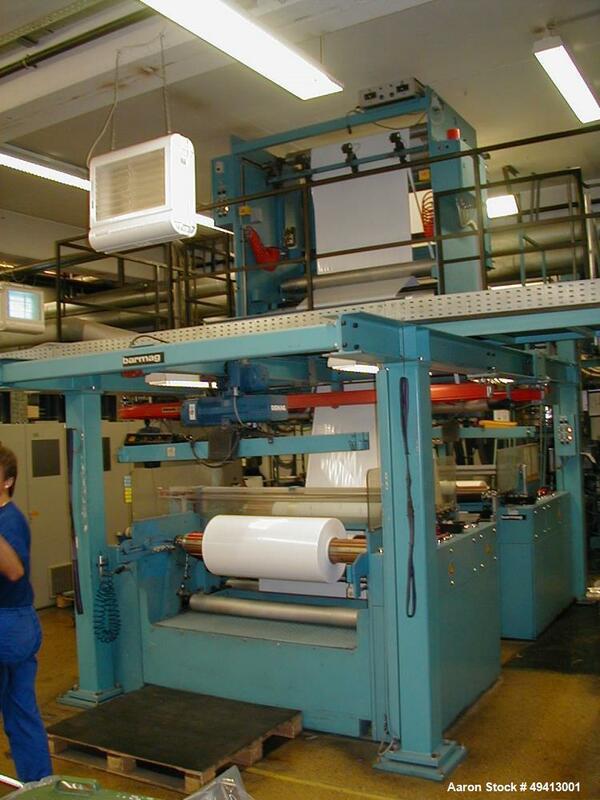 (1) Barmag 54.6" (1400 mm) wide take off double winding station, type FWI9/1400-A/G-2. 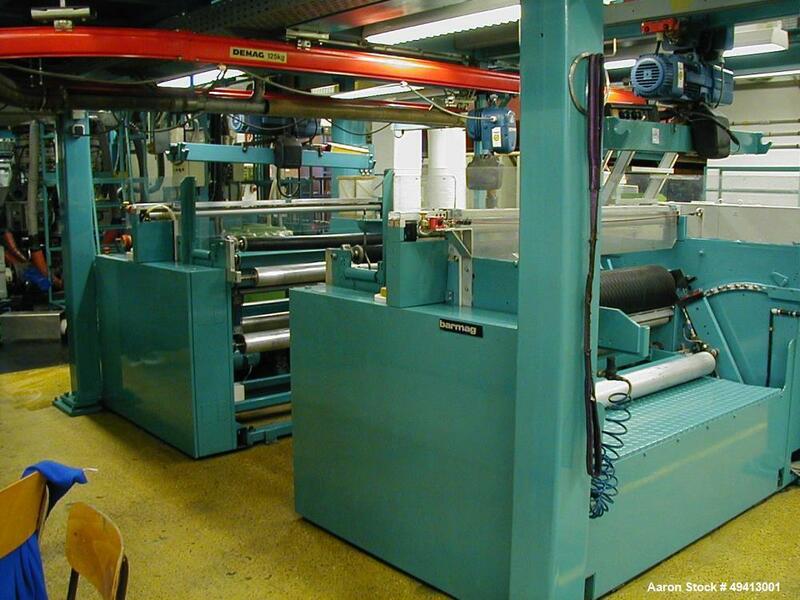 Max winding capacity 227.5 (70000 mm) per minut. Max dia. 31.2" (800mm) roll. 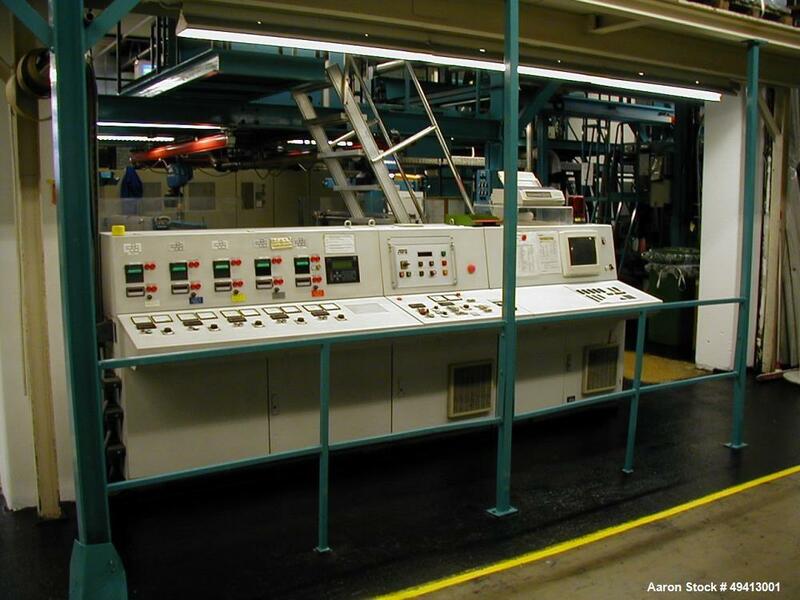 Includes control panels and further infrastructure. New year 1992.